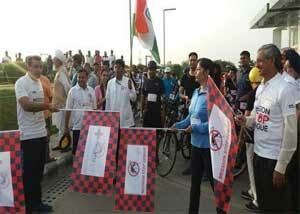 Gurgaon : In order to raise awareness against the deadly disease of dengue, Medanta the Medicity organised a 10 Km Cyclethon. The initiative in association with Gurgaon Police and Decathalon was flagged off by the Police commissioner of Gurugram, Mr. Sandeep Khirwar and Ms. Mamta Singh, IGP/CPT & R, Bhondsi. 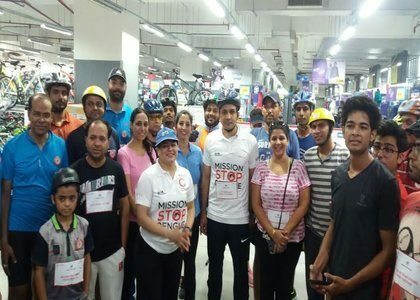 Over 100 cyclists including the kids of Nirvana Cricket Club participated in the event which was aimed to educated the masses and mobilize individuals and communities to do their bit and help in the fight against dengue. Medanta the Medicity also organised a nukkad natak before the flag off ceremony to create awareness about dengue. The focus of nukkad natak was on prevention and precautions to be taken against this deadly disease. According to World Health Organisation (WHO), there are about 190 million cases of dengue worldwide. The health department in Gurgaon is already on alert, as dengue cases are expected to rise due to the onset of monsoon season. 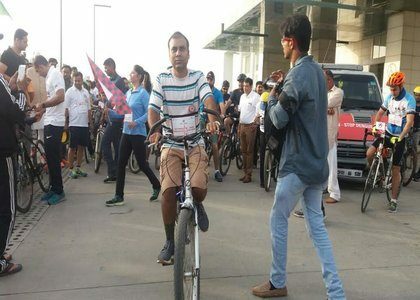 The 10 Kilometer Cyclethon started from Medanta hospital going through Bakhtawar Chowk, Subhash Chowk, Rajiv Chowk and Civil Lines and ended at the police lines. To mark the closing of the event, Dr. Naresh Trehan, Chairman & Managing Director, Medanta – The Medicity along with Gurgaon Police Commissioner, Mr. Sandeep Khirwar released balloons in the airs. 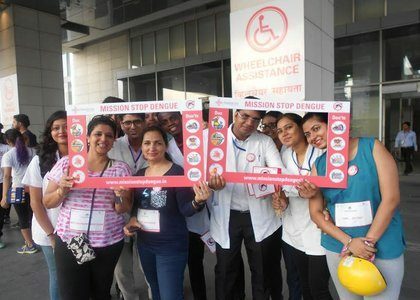 The initiative witnessed registration across age groups to create awareness through ‘Mission Stop Dengue’. 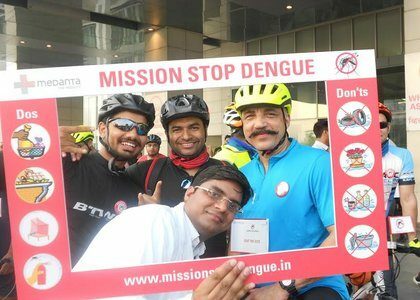 Mission Stop Dengue was initiated by Medanta last year in association with over 80,000 students of Gurgaon, Lisana, Jhajjar, Manesar, Faridabad and Delhi NCR. Medanta has also distributed anti-Dengue kits (powered by Mortein) to the Safai Karamcharis of the MCG and school students and other Dengue champions in the month of May. The kit has tools available to detect and prevent dengue (water sample collection kit, magnifying glass to spot the larvae in the sample, oil to cover the puddles, and various mosquito repellents).